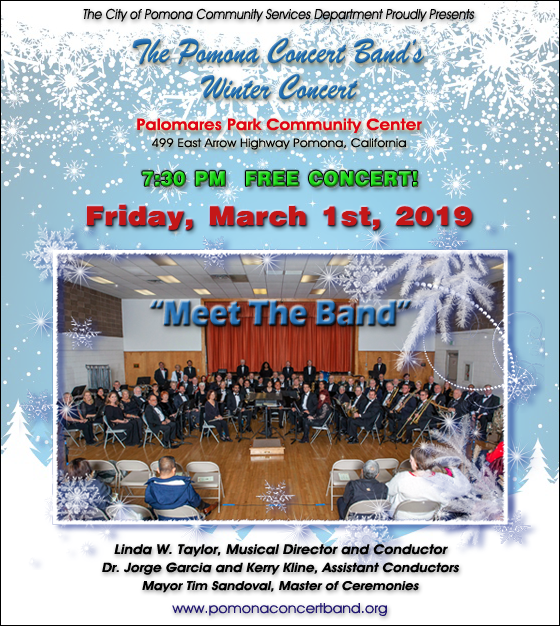 The Pomona Concert Band proudly presents their annual Winter Concert titled "Meet the Band" on Friday, March 1st, 2019 at 7:30 pm. The concert will be held in the Palomares Park Community Center, 499 E. Arrow Hwy in Pomona and is sponsored by the City of Pomona Community Services Department. The concert is FREE to the public. Refreshments will be served at intermission. The Master of Ceremonies for the evening will be the Mayor of Pomona, Tim Sandoval. The concert will feature soloists and sections of the band. President of the band's Board of Directors, Allan Small, will play a Trumpet solo titled "Dramatic Essay" by Clifton Williams. Allan's solo will be dedicated to Tom Murie, a former Trumpet player with band, who passed away this past year. Lucas Critchfield will perform a Marimba solo, titled "Empress of the Pagodas" composed by Maurice Ravel and arranged by Dr. Jorge Garcia. The entire low brass section will be featured in "Them Basses March" by Getty H. Huffine. In addition to these pieces, the band will play "Crown Imperial" by William Walton, "Communion" by Carl Strommen, "In The Shining of the Stars" and "Oracles of the Sirocco" both by Robert Sheldon, "Everest, the Forbidden Journey" by Rob Romeyn, "Symphonic Songs for Band" by Robert Russel Bennett, and "Encanto" by Robert W. Smith. Don't miss this concert by one of the premier community Wind Bands in Southern California. The best part is that the concert is FREE. So bring your entire family and invite your friends to Palomares Park on March 1st at 7:30 pm. The Pomona Concert Band is under the baton of Linda W. Taylor, Conductor and Musical Director, along with Assistant Directors Dr. Jorge Garcia and Kerry Kline. Band members come from Pomona and more than twenty surrounding communities to make music together. 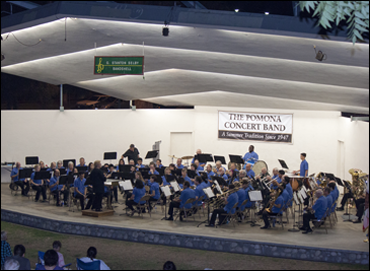 The Pomona Concert Band completely redesigned their webite last May. You can go to www.pomonaconcertband.org to view all the new features including a new photo gallery and video gallery. The band has created a new YouTube Channel, along with Facebook, Twitter and Instagram websites. So click on the icons at the bottom of this email and visit our sites and let us know what you think. Donations to the band are always welcome and appreciated. The community can help support the Pomona Concert Band by becoming a supporter of The Friends of the Pomona Concert Band at the FRIENDS level ($99 & under), PATRONS ($100+), BENEFACTORS ($500+) and DISTINGUISHED BENEFACTORS ($1,000+). All Donor's names will be included on every program and our website for the entire concert season. The Friends of the Pomona Concert Band is a registered charity under Internal Revenue Code Section 501 C (3). Checks may be made out to: Friends of the Pomona Concert Band, P.O. Box 2753, Pomona, CA 91769.